Dr. Lisa Jensen has been providing comprehensive dental care to families in Portland and surrounding communities since 2005. We believe everyone deserves a beautiful, healthy smile, and it is our goal to offer state-of-the-art dental care focused on prevention and patient education. Your optimum dental health is our focus. Dr. Jensen and her staff are committed to ensuring you have a positive experience in our office. Ours is a family-friendly, relaxed dental practice where our patients’ needs are at the forefront of everything we do. From general and restorative dentistry to periodontal treatments, cosmetic dentistry, and even orthodontics, we have the tools and products to get your smile healthy and keep it that way! Children and adults alike can take advantage of a lifetime of oral health, created by a doctor and staff who truly care. 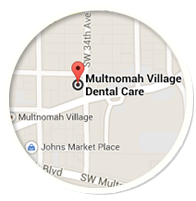 We look forward to welcoming you and your family to Multnomah Village Dental Care. Contact our Portland dental office to schedule an appointment!